Best Car Repair Garajes in Pune What are the different types of car dents? What is the most frustrating thing that can happen to your car? These dents are caused by round objects such as stones or pebbles, pebbles only if you hit it hard and also hail. Round dents can make the dent appear like a shallow funnel by featuring a point in the middle. Dents can also be rounded but contain no central point in the middle. This is where applying PDR can definitely solve your problem. Creased dents are caused when a sharp object is dragged along the panel of the vehicle. These dents are commonly found on the side of the cars. Depending on the severity, the creased dents can cause further dents and points on the body of the vehicle, and grow worse over time. Sharp dents are the dents that occur on the body lines of a vehicle. The body lines that occur along the side of your car are referred to as swage, and because these points often protrude just a little, during small accidents they’re commonly one of the first areas of the car hit. Sometimes, minor collisions may make one dent, but it’s also common for a small dent above and below the swage to occur. 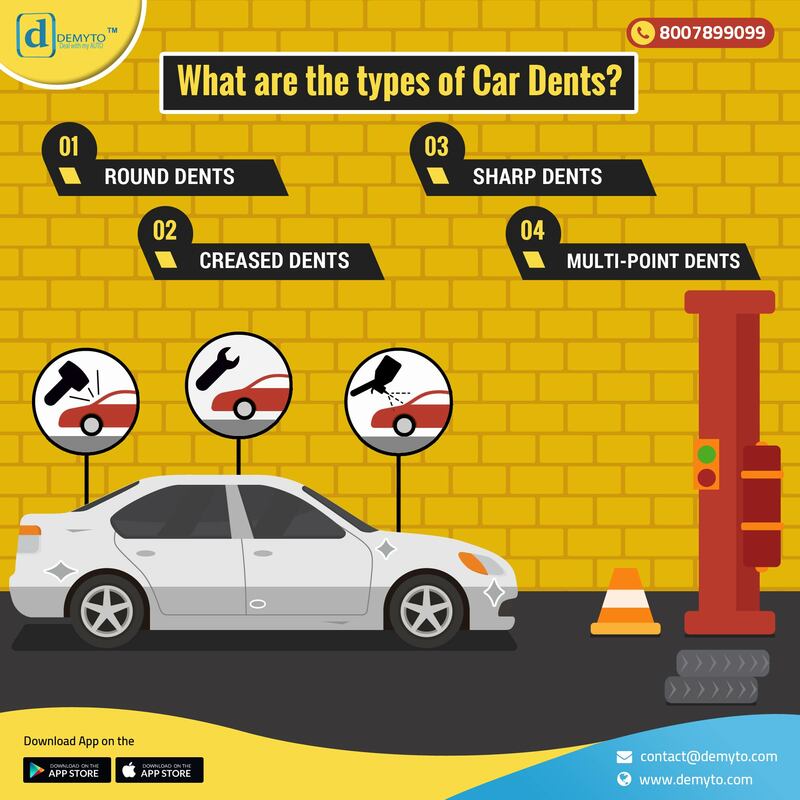 When you're in a minor car accident, dent always doesn't have a particular surface or point to get hit but can have multiple ways and points to hit the car. These dents can range in complexity and size, but with the right care, even multi-point can be cured with PDR. Now, this is the time when DEMYTO comes in for rescue. DEMYTO has successfully fixed football sized dents before. Get your car serviced at DEMYTO and save 25% on your car servicing and repair.